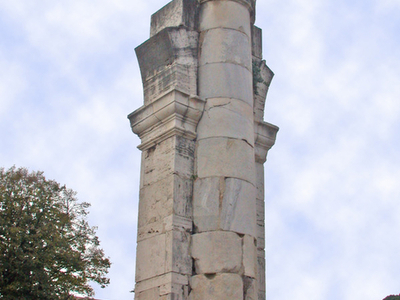 The Basilica Julia (Italian: Basilica Giulia) was a structure that once stood in the Roman Forum. It was a large, ornate, public building used for meetings and other official business during the early Roman Empire. Its ruins have been excavated. What is left from its classical period are mostly foundations, floors, a small back corner wall with a few arches that are part of both the original building and later Imperial reconstructions and a single column from its first building phase. The Basilica Julia was built on the site of the earlier Basilica Sempronia (170 BC) along the south side of the Forum, opposite the Basilica Aemilia. It was initially dedicated in 46 BC by Julius Caesar, with building costs paid from the spoils of the Gallic War, and was completed by Augustus, who named the building after his adoptive father. Here's the our members favorite photos of "Ruins in Rome". Upload your photo of Basilica Julia!